Many of the world's top airlines offer a so-called "Premium Economy" product on long-haul flights and Lufthansa (Europe's first Skytrax 5-Star Airline) is no exception. The offering aims to bridge the gap between Business and Economy, appealing to a market segment which is willing to pay a little more in exchange for a little extra comfort but unwilling to spring for a Business Class ticket. I originally purchased an Economy Class (K) return ticket for €538/£475, which I considered good value for money. 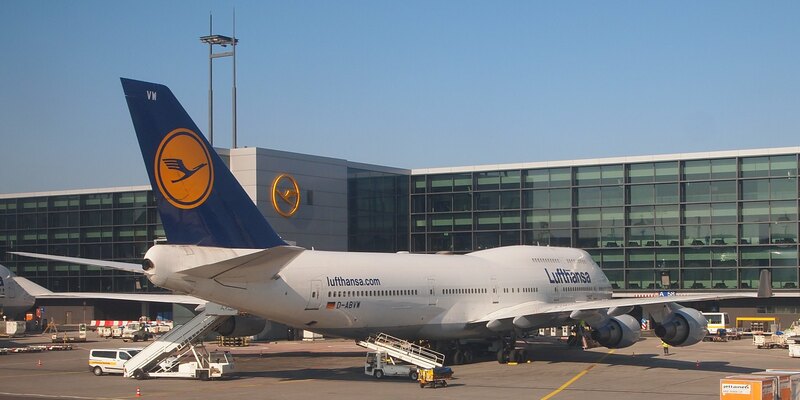 Lufthansa, however, offers the possibility to purchase upgrades after booking. Additionally, the airline offers passengers the opportunity to bid for an upgrade until 72 hours before their flight is scheduled to depart. This latter tool allows passengers to name their own price, but, unlike simply purchasing an upgrade, one is not guaranteed success. Nevertheless, figuring that I had nothing to lose thereby, I chose to exercise this option and made a bid of €180/£160. Three days prior to my flight, I was informed by email that my bid had been successful and invited to select a seat in the Premium Economy Cabin. Passengers travelling in Lufthansa Premium Economy are permitted two items of hold luggage, each weighing up to 23kg/50lbs - twice the allowance of regular Economy. 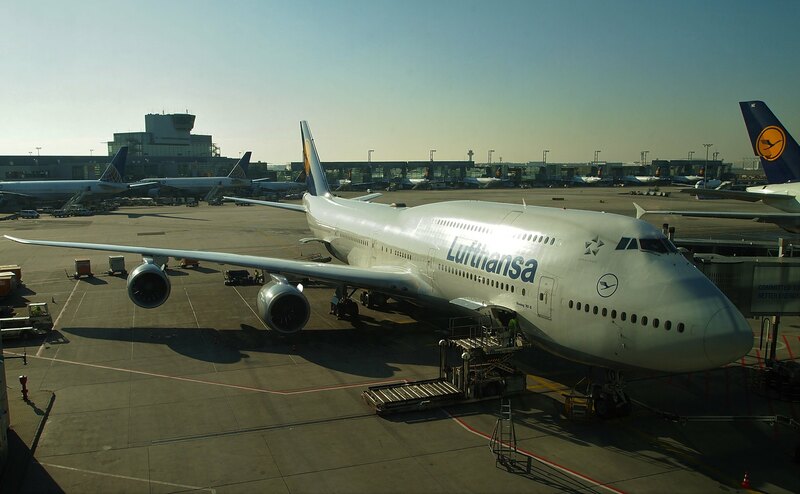 Moreover, a Premium Economy ticket entitles the holder to access the Lufthansa Business Lounge for the fee of €25. If you are taking an early morning flight from Frankfurt Airport, I would recommend spending the night in one of the many Airport Hotels in the area. I chose the 'Comfort Hotel, Frankfurt Airport West', which I have used on multiple occasions and offers excellent value for money, as well as a shuttle service to and from the airport. On this occasion, I elected to take the 07:30 shuttle to the Airport. Unfortunately, at 07:30 there was no sign of the bus, which eventually arrived at 07:40, driven by an incredibly brusque gentleman who succeeded in upsetting half of his passengers before they had so much as set foot on the bus. As well as being in a bad mood, he was in a terrible rush and announced loudly to those assembled that he would be taking the Autobahn to the airport in order to get to there as quickly as possible. Unfortunately, there had been an accident on the Autobahn, which meant that our ten-minute sprint became a forty minute slog. Of course, this only served to anger our driver further, and he was in a fine state by the time he deposited us outside Terminal 1. Things began looking up at the airport, where check-in was quick, easy and entirely automated. Staff were, however, on hand to assist with any problems. Lufthansa does not provide a dedicated Premium Economy check-in lane, or any 'Fast Track' privileges at security, which meant it was another half an hour and one pat-down later before I cleared security and entered the airside portion of the airport. Although fast-track security is off-limits, Premium Economy passengers may, as I outlined above, access the 'Lufthansa Business Lounge' for a fee of €25. Being keen to sample the lounge, and with time limited, I made my way there immediately. The lounge was not very busy at this hour, and I had no problem finding a place to sit. The lounge offered an extensive breakfast buffet, which included cold meats and cheeses, along with a selection of breads ("Aufschnitt und Käse" und "verschiedene Brote" auf Deutsch). Scrambled eggs were also available for those seeking a hot breakfast. Aside from food, a wide variety of drinks were available, along with a good range of complimentary magazines and newspapers. The lounge is spacious, airy and well-appointed. I was very much looking forward to my first flight aboard the latest iteration of the Boeing 747, of which only 47 are in passenger service around the world. 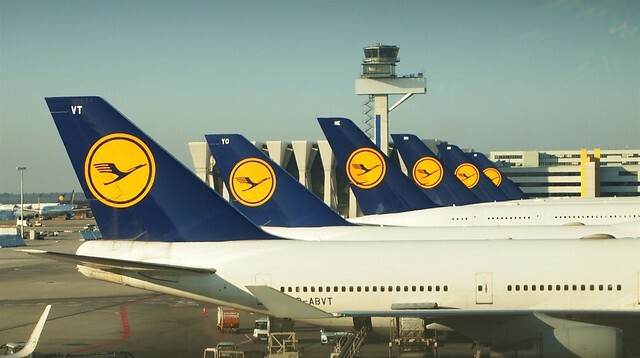 19 of those 47 are owned by Lufthansa, making the airline the largest operator of the type. Other passenger operators include Air China and Korean Air, but unfortunately the 747-8, which was launched by Boeing in 2005 and first flew in 2010, has suffered from weak sales - largely as a result from competition from within Boeing's own product lineup in the form of the Boeing 777. Not being very hungry, I took a small plate of sliced sausage and cheese, along with a glass of red wine (is it ever too early when travelling?). I was able to rest in the comfortable surroundings of the lounge for around one hour, but unfortunately my late arrival precluded my spending any more time here, and before I knew it it was time to make my way to Gate Z52 in preparation for boarding. Boarding began on time. Premium Economy passengers were invited to board at the same time as the Economy Cabin, and I received a warm greeting onboard. My first impressions of the Premium Economy cabin were good, it being configured in a comfortable 2-4-2 layout (compared to the 3-4-3 layout in the main Economy Cabin) and each seat being equipped with a footrest, adjustable headrest and wide armrests. My seat, 21K, boasted the added advantage of unlimited legroom, being situated directly behind the 3R door. Regular Premium Economy seats offer a seat pitch of 38-inches. Menus were handed out prior to takeoff, while bottles of water, blankets, headphones and amenity kits were placed at each seat prior to boarding. A few seats remained empty in the Premium Economy cabin on this flight. Pre-departure drinks were handed out shortly before pushback. Passengers are offered a choice between minty orange juice and water. I chose the former. From the outset (engine-start), the Boeing 747-8 proved herself to be considerably quieter than the Boeing 747-400. The ambient noise levels in the cabin did not increase dramatically as the engines were started and we began our taxi to the runway. The relatively long taxi to Runway 07C took us past D-ABYK, a company Boeing 747-8 named 'Rheinland Pfalz'. This name was previously assigned to D-ABVT, but was transferred to D-ABYK upon her entry into the Lufthansa fleet in August 2013. Shortly afterwards, we passed the Airport Tour Bus, which was full of visitors waving at our aircraft as we taxied by. Following a powerful takeoff roll, the wings of D-ABYO flexed and lifted us into the air above Hesse. Unlike the 747-400, the 747-8 has a wingspan of approximately 224ft/68m (compared with 211ft/64m) and boasts beautiful raked wingtips. Indeed, the wing can be considered a work of art in itself. Although my view was largely obscured by said wing, it was still possible to take some photographs of the snow-capped German landscape during turns. The climbout was a little bumpy, but although all four GEnx-2B67 engines (which each produce 66,500lbf of thrust) were working hard to propel the aircraft ever higher, the cabin remained very quiet. After takeoff, I turned my attention to the In-Flight-Entertainment system. Because I was sitting in the Exit Row, the screen therefor had to be extended from beneath the armrest. Unfortunately, doing so proved rather difficult, and I ended up kneeling down on the floor in front of my seat in order to finally free the device. In spite of this initial difficulty, the system itself proved very easy to use. A remote control was provided at my seat, but it was also possible to use the very responsive touchscreen in order to make a selection. The range of entertainment was less extensive than that available aboard KLM and Delta flights, but there was still more than enough to pass the time on this flight to New York. To begin with, I settled on some German Schlager Music - a genre rather unique to Lufthansa! Two exterior cameras (forward and downward) were also available. A set of headphones were provided, but since I had brought my own, I decided not to use them. Aside from the IFE system, the 'Lufthansa Magazin' is undoubtedly one of the best in-flight magazines in the business, and I enjoyed reading an extensive article about the new Lufthansa brand. The inflight service began around 30-40 minutes after takeoff with a snack service. To my surprise, the snack was already packaged in accordance with the new branding. Two flight attendants then followed with the first drinks service; offering an extensive range of alcoholic and non-alcoholic drinks. I chose to enjoy a glass of Sekt, which was delivered with a smile. I was also pro-actively offered a glass of water to go with it - although I declined, the attentiveness displayed was much appreciated. Hot towels then followed. A short while later, the main meal service began. 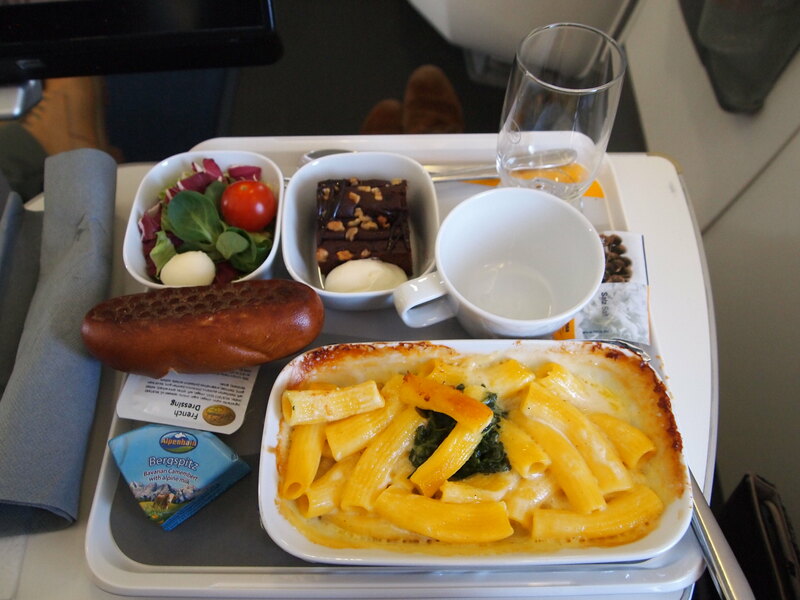 On today's flight, the menu offered a choice between 'Chicken Breast Piccata with Tomato Sauce, Ratatouille and Spaghetti' and 'Rigatoni Pasta with Cheese Cream Sauce and creamy Spinach'. I chose the latter, and was not disappointed. The meal was also advertised as being accompanied by a 'Seasonal Salad with Cherry Tomato and Mozzarella Cheese' with a French Dressing and a 'Brownie with Cream'. Warm Brezel Bread was also offered. The entire meal was served on ceramic tableware, with a large serviette, metal cutlery and a proper glass. Overall, the presentation was very good, and the food itself was of good quality and taste. I particularly enjoyed the salad, which tasted crisp and fresh, and had no complaints about the portion size. Following the drinks service, a flight attendant passed by as I was eating, offering water if so desired. Upon conclusion of the lunch service, an after-dinner drinks service began, offering tea, coffee or a digestif. I chose a glass of brandy, which was the perfect way to end an impressive meal. Shortly, the cabin was tidied and duty free was offered. I asked about Lufthansa products and was offered a 1:500 scale model for 34 Euros. As it turned out, the model available was one of D-AIME, the Airbus A380-800 named 'Johannesburg' which had been parked next to my aircraft in Frankfurt. Being a 'Miles and More' member, I also earned miles through this transaction. Happy with my purchase, I spent some time listening to some more music, taking photographs from the window and working on my trip report. With the flight progressing smoothly, I then watched a couple of episodes of 'The Big Bang Theory' on the IFE system - in English, but with German subtitles. The IFE system also included a number of interesting short documentaries about Lufthansa, including one concerning the airline's vintage Junkers Ju 52 - an aircraft affectionately known as 'Tante Ju'. Also available were a couple of videos regarding the Boeing 747-8 Retrojet (D-ABYT) and the introduction of the Airbus A350 into the Lufthansa Fleet. With around two hours remaining before landing, we crossed into Canadian Airspace, where we encountered some turbulence. The Captain announced that he was expecting significant levels of turbulence for around half an hour based on reports from another aircraft and asked everyone to remain in their seats. In the end, the ride was not too uncomfortable. One and a half hours prior to landing, the pre-arrival snack was served. Advertised in the menu as 'Smoked Salmon with Creme Fraiche and Penne Arugula Salad', with a dessert of 'Fruit Salad with Honey and dried Lingonberries', this meal, like the last one, was very good. Again, a drinks service followed, and I once again chose a glass of Red Wine. 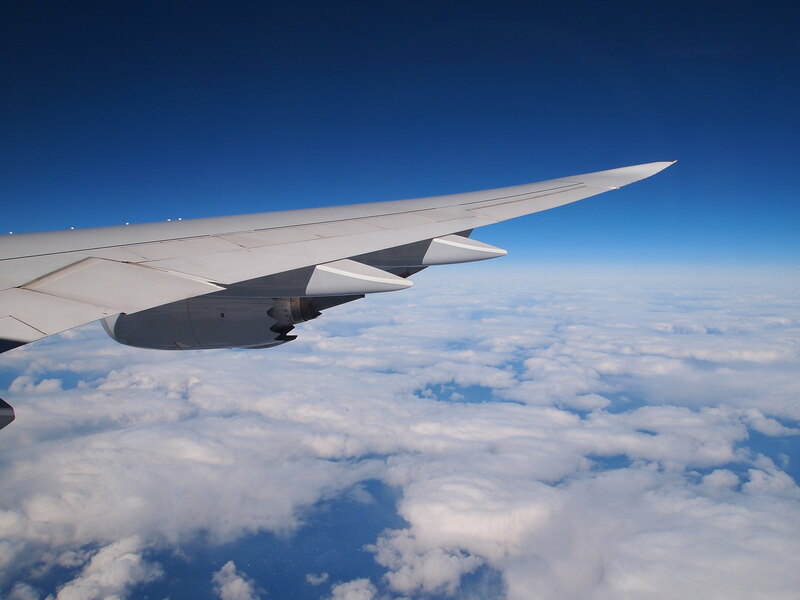 As we entered US Airspace (where the weather was noticeably worse than over the Atlantic), a second hot towel was offered, after which the cabin was tidied in preparation for arrival in New York. Thirty minutes prior to landing, as we were flying over Boston, the Captain announced that we would be landing shortly and that the weather in New York was expected to be seven degrees celsius and cloudy. During the long approach to New York City, Flight Attendants collected up all headphones. Surprisingly, it appears that Lufthansa reuses these Economy Class devices. Around the same time, an announcement was made to advise passengers to refresh their knowledge of the Safety Card prior to landing. We landed firmly and taxied the relatively short distance to Terminal 1, where we pulled into the gate alongside OO-SFM, an Airbus A330-300. One of the earliest A330s, this aircraft was originally delivered to Air Inter in 1994 as F-GMDA. In 1997, she became OO-SFM with Sabena and now operates for Brussels Airlines. After our aircraft had been towed the final few feet into the gate (on account of the limited clearance with the adjacent A330), I disembarked fairly quickly with a friendly farewell from the crew. My flight with Lufthansa had been very impressive - in terms of both the hard and soft product. The Premium Economy seat was a very comfortable place to spend eight hours, while the food was of good quality, the range of drinks was extensive and the service polite, friendly and attentive. Some improvements could, however, be made to the range of entertainment available on the IFE system. Unfortunately, D-ABYO did not make it back to Frankfurt that evening. As the aircraft was climbing out of JFK that evening as Flight 401 to Frankfurt, a severe problem arose in the #1 Engine. The pilots made the decision to return to JFK, where, according to 'The Aviation Herald' (1) "metallic debris was found in the engine exhaust" and the turbine was found to be "severely damaged". The aircraft remained on the ground in New York for approximately one week while the engine was replaced. Why were passengers reminded to review the safety card just prior to landing? That is unsettling. It is only on Lufthansa Group airlines that I have heard this. It seems standard procedure for them, but I agree it might not come across very well. I guess, statistically speaking, that landing is a time of heightened risk. Mind you, as the aircraft did have a bit of an incident on the very next flight, I'm not going to complain about Lufthansa being extremely safety-conscious! Thanks for sharing, looks a solid offering. I need to get onto the 748 at some point, that wing is beautiful. Despite the name I am a Boeing man through and through! It is a solid Premium Economy offering, but I do feel that the regular Lufthansa Transatlantic Economy offering is slightly inferior to other carriers, including Delta. I agree about the 747-8, what a beauty! Had the same in December on a KLM flight to Manchester but fail to see why it's unsettling. Actually, I think it a very sensible and proactive policy. Wouldn't bother me at all. Yes, in hindsight it is not a bad idea in the event of an accident on landing, but it is a little odd. Thanks for taking the time to share your trip report with us. The LH Y+ product looks very solid indeed-very different from the product offered by their partner UA-all you get is 3 more inches of legroom. Other than that, product is identical to regular Y. Although I hear UA will finally be updated their Y+ with a distinct soft product. Shame about the experience with the airport hotel shuttle-I hope you complained. I hope no one missed their flight! Thanks for taking the time to comment! I was impressed with the LH Y+ product and appreciated the extra touches like a pre-departure beverage and lounge access. Yes, United will be updating their product soon, and it looks quite competitive. Yes, it was a shame about the shuttle. There were some other passengers more annoyed than I, so although I didn't complain, I guess the hotel heard from them. I was just on a Delta flight last week and they did the same thing. First time I've seen that. It's a standard announcement on BA as well as reminding you to remind yourself of the location of the nearest exit, and in the even of an emergency, leave all belongings behind. Thank you for the trip report. Enjoyed it very much, especially anything flying out of Germany. It seems to be standard on EasyJet as well, or at least it was on my flights at the weekend with them. Another great trip report! The 747-8 is magnificent, isn't it?